In what might be the first face-off of its kind, trained forensics examiners from the FBI and law enforcement agencies worldwide were far more accurate in identifying faces in photographs than nonexperts and even computers. The new assessment provides “the first strong evidence that facial forensic examiners are better at face recognition than the rest of us,” says a face recognition researcher. The new assessment provides “the first strong evidence that facial forensic examiners are better at face recognition than the rest of us,” says Jonathon Phillips, a face recognition researcher at the National Institute of Standards and Technology (NIST). When scores were averaged across all facial forensics examiners — modeling the forensic-lab practice of engaging several examiners to weigh in on face comparison decisions — the experts achieved a near-perfect mark of 0.997. Phillips and colleagues from the University of New South Wales and the University of Texas at Dallas reported the results of their comparative study in the Proceedings of the Royal Society of London. NIST says that the research responds to a 2009 National Academy of Sciences report that called for efforts to build the scientific foundation that supports forensic practices. The report recommended that NIST, among other organizations, develop protocols and best practices that form the basis for standards. In this initial set of experiments, the scientists tested three groups: forensic facial examiners who are specially trained to compare facial images for law enforcement, people who work in the field of facial recognition but are not examiners, and students. All participants reviewed pairs of faces on a computer screen and judged whether the faces belonged to the same person. The faces were chosen because they were hard to recognize — very difficult for computer algorithms to distinguish between. 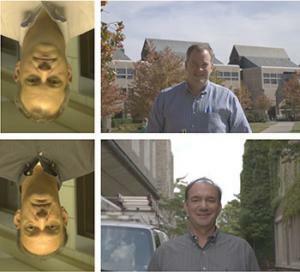 One of the new tests asked test participants to compare closely cropped faces that were displayed upright and upside-down. Participants were challenged to compare faces within 2 seconds — and then thirty seconds. The examiners’ accuracy improved when they had a longer time to study the faces, and they performed better than other groups with the inverted faces.